A bathroom remodeling project used to be simple when only a limited selection of styles and colors were available. Bathrooms were sized to fit only a toilet, tub and sink, with little space to spare. The sole purpose was to provide a room for personal hygiene. Times have changed, and bathrooms have evolved. Bathroom remodeling projects are larger than ever. The options are endless, from a therapeutic spa for the whole family to a personal refuge. The advance designs of bathrooms are far more interesting and attractive today, but it does make the process a bit more complex. Everyone starts and ends their day with a trip to the bathroom. This room, however, is often stylistically and spatially neglected. It’s often a few functional plumbing fixtures tucked into an exceptionally small room – not exactly a mood brightener. 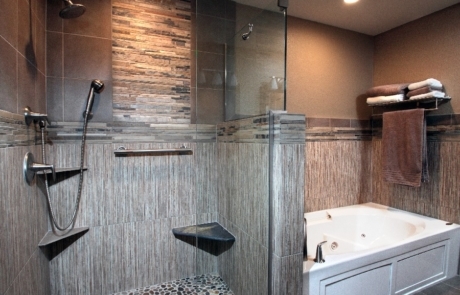 For your bathroom remodeling project, think beyond the basic box. Bathroom remodeling projects should match the style of your personality and it’s daily users. Keep track of even the most far-fetched ideas. Clever thinking might provide you with the perfect solution. Our project gallery will guide you toward your dreams and help you create a working plan, whether that involves incorporating a dreamy whirlpool tub or adding a powder room for convenience. 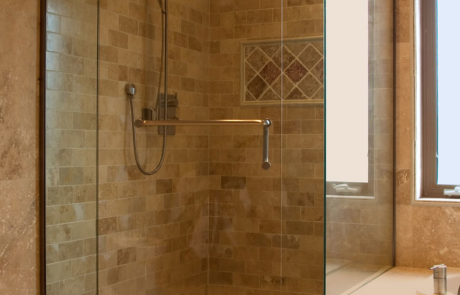 A great bathroom remodeling project is about more than the bells and whistles. Before you spring for that luxurious whirlpool tub or glamorous vessel sink, you need to ask yourself some important questions. How often will this bathroom be utilized? Who will be using it? Where is it located? How much do we want to invest? The answers to these questions will help guide you to make the right decisions about fixtures, materials, layout and style. Some of our most recent award winning bathroom remodeling projects are located in: Menomonee Falls, Brookfield, Mequon, Elm Grove, Sussex, Whitefish Bay and Wauwatosa.